LaGuardia plane off runway: Delta flight skids, flights canceled. The nose of the plane after it came to rest. New York’s LaGuardia airport will be closed until at least 7 p.m. after a Delta airplane carrying a reported 149 individuals skidded off a runway in stormy winter weather; no serious injuries have been reported. The plane was landing on the airport’s runway 13—which, as you can see in this image, is adjacent to the water of the East River and Flushing Bay—and slid up a safety berm and through a fence before coming to a stop. Passengers on flight 1086, which was arriving from Atlanta, left the plane via inflated emergency slide. New York’s JFK airport, and the nearby Newark airport in New Jersey, are (for now) still open. 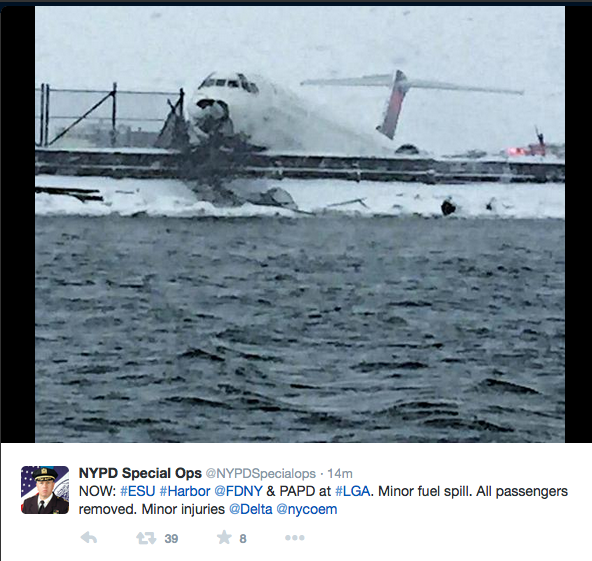 *Correction, March 5, 2015: This post originally misstated that 19 people were killed in the 1992 LaGuardia crash.